Retired Teamsters around the nation who are facing dramatic cuts to their monthly pensions are keeping their fingers crossed that proposed federal legislation will keep them from financial ruin. The legislation, called the Butch Lewis Act and introduced last month by Sen. Sherrod Brown, (D-Ohio), is now subject to intense lobbying by union members and others on Capitol Hill with the hope that it becomes attached to the new spending bill Congress is expected to soon enact. On Dec. 6, retired Teamsters in Akron, Ohio, were updated on the act by Mike Walden of Cuyahoga Falls who with others has spearheaded national efforts over the last four years to rescue union retirees from gut-wrenching drops in their financially troubled Central States multi-employer pension plan. A 2014 federal law allows multi-employer pension plans to significantly reduce retiree payments as a means to remain solvent. Retirees in the Teamster’s Central States pension plan have been facing possible monthly pension cuts of as much as 69%. There are about 48,000 retired Teamsters in Ohio, with thousands in the Greater Akron area and hundreds of thousands more around the nation. 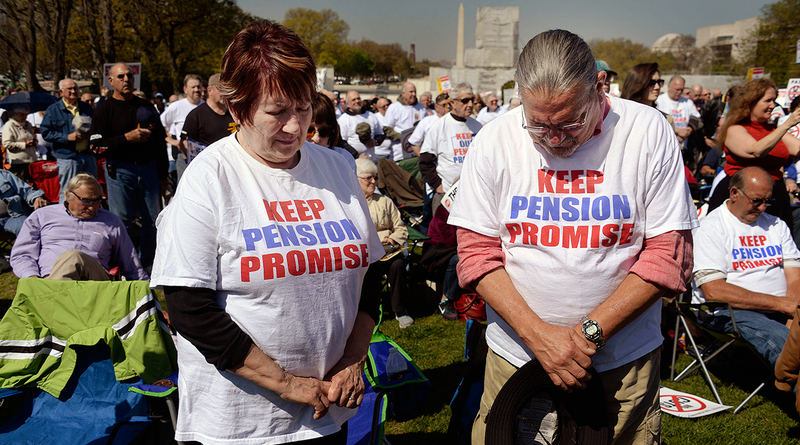 Other troubled union pension plans already have cut monthly payments to retirees. This latest federal plan to prevent that scenario is named for the late Butch Lewis, retired head of Teamsters Local 100 in Evendale, Ohio, who died in 2015 and was part of the movement to save union retiree pensions. “We’re going to need more support,” said Walden, head of the Northeast Ohio Committee to Protect Pensions. He urged the hundred-plus retirees at the meeting in the Knights of Columbus Hall on Glenmount Avenue to write and call their congressional representatives. “We need this done by the end of the year,” Walden said, explaining that it will take time for the act to be implemented. Passage by Dec. 31 would likely mean that the plan could be put into place by early summer. Actuaries who have looked over the math in the Butch Lewis Act say it will work, Walden said. The act creates a new office, the Pension Rehabilitation Administration, in the U.S. Treasury Department. The office would allow troubled pension plans to borrow money at low interest rates and in turn continue making payments to retirees. According to Brown’s office, the money for the loans and the cost to run the pension office would come from selling Treasury bonds to financial institutions such as banks. The PRA would provide 30-year loans at low interest rates to financially troubled union pension plans. The pension plans are expected to repay the loans as their financial health improves. The plan was initially developed by the Teamsters and then refined by Brown and his staff, Walden said. The Teamsters next week will bus retired union members to Washington, D.C., and put them up overnight in a hotel as part of an effort to urge congressional members to support the Butch Lewis Act. “We have some Republicans that are very, very close to signing on to the Butch Lewis Act,” Walden said. Republicans have been largely concerned about what happens if a loan in the program created by the act defaults, Walden said. Getting their support might require a change in part of the proposed law to create a safety net, he said. Joe Kline, 69, a Suffield Township resident and retired driver with USF Holland, said the Butch Lewis Act is not a taxpayer bailout of the Central States plan. “We paid into it [Central States]. This will help salvage it,” Kline said. The Butch Lewis Act ultimately could ensure more comfortable retirements for as many as 10 million Americans, he said. Ed Barker, 68, retired two years ago as a driver with ABF Freight. The Austintown resident and retiree from Teamsters Local 377 in Youngstown said he became involved in the fight to save the union pension plan fairly recently. ABF is a subsidiary of ArcBest Corp. which ranks No. 12 on the Transport Topics Top 100 list of the largest North American for-hire carriers. He said the U.S. government failed in its obligation to make sure the Central States Pension Plan remained solvent. The Butch Lewis Act looks like the right approach, he said. If no action is taken, the subsequent drastic cuts in pension payments will force retirees to become more dependent on government money, he said.